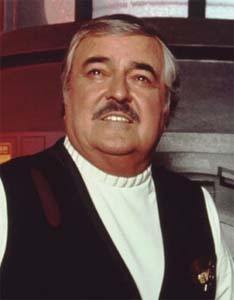 James Doohan was a bonafide war hero. An enlisted man who rose to captain in the Royal Canadian Artillery, he was in the frontlines on D-Day, where he was shot seven times, with an eighth bullet lodging in his metal cigarette case. Three bullets shredded the middle finger of his right hand. Eventually, the finger was amputated, which is occasionally noticeable in Star Trek episodes and movies. Returning from the war, Doohan worked as an actor on Canadian radio, then came to New York, where he studied drama alongside classmates Leslie Nielsen and Tony Randall. He was a regular on the Canadian kids' science fiction series Space Command. His early American television work included episodes of Gunsmoke, Bonanza, Daniel Boone, The FBI, Hazel, The Virginian, and The Outer Limits. Gifted at mimicry, Doohan invented his Star Trek character's Scottish accent when he auditioned for the role. "I did about eight different accents when I was reading... Gene asked me which one I liked, and I said, If you want an engineer, you'll want a Scotsman... and he made me Montgomery Scott." In pre-production for the first Star Trek movie in 1978, Doohan was asked to create assorted odd vocal grunts and growls as the spoken Klingon and Vulcan languages. Though he never received on-screen credit, his efforts formed the basis for the sound of both languages in subsequent Star Trek movies and TV episodes, and Doohan's Klingonese was later expanded by linguists into the Klingon language spoken on screen and by Trek obsessives. After Star Trek was cancelled in 1969, Doohan was just another out-of-work actor, but it wasn't until the early 1970s, when Star Trek reruns became popular, that he started feeling typecast. Flat broke and close to unemployable, Doohan wondered if Star Trek might have the biggest mistake of his career -- until he noticed he could make a very nice living just making personal appearances as "Scotty". In subsequent years, Doohan played Commander Canarvin on Jason of Star Command, co-authored three science fiction novels with S. M. Stirling, and occasionally appeared on The Bold & The Beautiful. Trading on Scotty's expertise in high-tech matters, Doohan narrated the 1999 documentary Cold Fusion: Fire From Water. For the animated Star Trek series, Doohan provided the voice of Scott and another character, Lt. Arex. In one episode, he voiced seven different characters. His performance as the miracle-working engineer inspired many young people to choose that career -- so many, in fact, that when Doohan was diagnosed with Alzheimer's and announced that he would be withdrawing from public life, the news was mourned in NASA newsletters and far-from-fandom publications like Aviation Week and Space Technology. In a grand tribute, the 2004 edition of an annual Star Trek convention in Hollywood was dedicated to Doohan, and dubbed "The James Doohan Farewell Star Trek Convention". It was announced as Doohan's last public appearance. In April 2007, almost two years after his death, Doohan's cremeated ashes were briefly rocketed into suborbital space, then returned to his family.